I know, I know. I’ve promised my substantive post on David Kris’ paper on the phone and Internet dragnets. I know, I know. My repeated harping on the failure to inform the 2011 House freshmen about the dragnet is getting tedious. But Kris dedicated 16 pages of his 67 page paper to arguing that the statutory requirements for briefing Congress about the dragnets (which Kris says require only Intelligence and Judiciary Committee briefing) have been met. He ultimately makes a half-hearted attempt to make the same argument Claire Eagan did about Congress adopting judicial interpretation. And he lays out the fatally weak case Ben Wittes has in the past to justify his wails of NAKED! The briefings and other historical evidence raise the question whether Congress’s repeated reauthorization of the tangible things provision effectively incorporates the FISC’s interpretation of the law, at least as to the authorized scope of collection, such that even if it had been erroneous when first issued, it is now—by definition—correct. There is a basic principle of statutory construction that “Congress is presumed to be aware of an administrative or judicial interpretation of a statute and to adopt that interpretation when it reenacts a statute without change,”208 as it did repeatedly with the tangible things provision. Of course, it would be ridiculous to presume that Congress adopted a classified interpretation of a law of which it could not have been aware. As described above, however, the historical record shows that many Members were aware, and that all Members were offered briefings on the FISC’s interpretation, even if they did not attend the briefings. And yet, in all those 16 pages, he offers not one whit of evidence that the 93 members of Congress elected in 2010 (save the 7 on the Intelligence and Judiciary Committees) could have learned about the program save two briefings offered in May 2011. Unless you count this argument, which suffers from a basic logic problem. Ultimately, though, Kris concedes (citing just the white paper, and not citing me, the Guardian, any other reporting, or Justin Amash’s public statements to the effect) that just maybe this information wasn’t passed on in 2011 — but don’t worry, the Executive did its job! Although the House Intelligence Committee did notify Members of the House of the classified documents and briefings in 2010 (when it was led by Chairman Sylvestre Reyes), it may not have done so in 2011 (when it was led by Chairman Mike Rogers). See White Paper at 18 n.13. Regardless of any intracongressional issues in 2011, as a matter of inter-branch relations, it is clear that the Executive Branch provided the materials with the intent that they be made available to all Members of Congress, as they had been in 2009. Now, Kris is a much better lawyer than the flunkies who wrote the Administration’s far weaker White Paper on Section 215, and his argument here betrays not only that, but, I suspect, a hint that he realizes the flaw in his argument. Notice in his claim that “all Members were offered briefings on the FISC’s interpretation,” he doesn’t argue all members got the Executive Branch notices on the program. He doesn’t argue that all members got briefed on the content on the notices. Rather, he claims only that they were offered briefings on the FISC’s interpretation. Is One of the Anwar al-Awlaki Memos a Revised Imminence Standard? I’ve been working on a theory on why the white paper is so crappy based, in part, on a problem international law experts keep making. For my purposes, Noura Erakat’s description of the problem will suffice, but a ton of people have raised it. Imminence is one element of the law of self defense and has no bearing upon the lawfulness of a target where there is an existing armed conflict. Instead, in ongoing hostilities, the legality of a target is a status-based assessment that distinguishes combatants from civilians. Unless he surrenders, a combatant can be killed regardless of activity. In contrast, a civilian retains his immunity unless he directly participates in hostilities, which is subject to a wholly distinct legal analysis. The point is this: if Al-Awlaki, or another target, is indeed a combatant in the U.S.’s ongoing hostilities authorized by the 2001 Authorization for the Use of Military Force (AUMF), an imminence analysis is not relevant at all. If, as the white paper sort of suggests, the AUMF is what justifies Anwar al-Awlaki’s killing and the government had evidence he was operational (that is, a legitimate combatant with AQAP after the point when AQAP was added to the official AQ roster) then imminence should be moot. So why is it in there, particularly in such a crazyass form? Consider, though, that we know there are multiple memos: two, according to DiFi, in the opening moments of the John Brennan hearing, though Ron Wyden insisted the Committee hadn’t received all the targeted killing memos and DiFi may have said they’re waiting on 8 more. Also we know that Ron Wyden has been asking whether the Administration killed Awlaki under AUMF or Article II authorities, suggesting that the Administration may be making arguments based on one or another in different memos. So I’m going to advance the wildarsed guess that — rather than being a simple summary of the June 2010 memo we know about — the white paper is actually a pained amalgam meant to encompass the more radical memos, while still retaining some patina of whatever decent argument Marty Lederman and David Barron made in June 2010.
https://www.emptywheel.net/wp-content/uploads/2016/07/Logo-Web.png 0 0 emptywheel https://www.emptywheel.net/wp-content/uploads/2016/07/Logo-Web.png emptywheel2013-02-08 19:40:122013-02-09 14:04:07Is One of the Anwar al-Awlaki Memos a Revised Imminence Standard? Glenn Greenwald has a typically provocative post on the news that Marty Lederman and David Barron wrote the authorization to kill Anwar al-Awlaki. He uses Dawn Johnsen’s comments on the way secret OLC memos create secret law that undermine democracy. From there, he notes that Lederman and Barron used the same justification–the AUMF–that John Yoo used to justify the detention without due process of Jose Padilla. So the AUMF allowed the President to designate Awlaki an “enemy combatant” without a shred of due process, and then to act against him using the powers of war, because we are at war with an entity for which Awlaki had become a combatant. I’m not sure I buy this comparison. There are times when the US might legally wage war against one of its citizens, but because of its own secrecy, the Administration has simply not made the case that that is true in this case. One of the big problems with Lederman and Barron’s interpretation of the AUMF, though–one Glenn doesn’t treat closely but which perfectly exemplifies Johnsen’s point–is the extension of the AUMF to apply to AQAP, an entity that simply didn’t exist when the AUMF authorized war against groups that had launched 9/11. Other assertions about Mr. Awlaki included that he was a leader of [AQAP], which had become a “cobelligerent” with Al Qaeda, and he was pushing it to focus on trying to attack the United States again. The lawyers were also told that capturing him alive among hostile armed allies might not be feasible if and when he were located. One area where Lederman’s reported memo is particularly dangerous, IMO, is in the extension of the AUMF to groups clearly not included in the congressional authorization. All the more so given events that have transpired since the memo was written in June 2010. One of the first things the new Chair of the House Armed Services Committee, Buck McKeon, did after last year’s election was to call for a new AUMF. Notably, he wanted to include Yemen (and AQAP) in the new AUMF. The Administration was disinterested in that new AUMF, stating they believed already had the authority to do what they need to. They claim to have that authority, of course, because Marty Lederman said they have it. No wonder they discouraged a new AUMF! 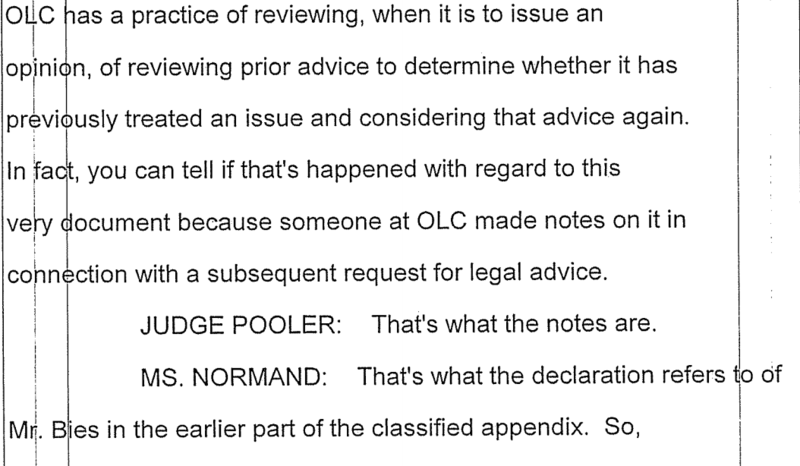 An open debate over the new terms of the AUMF might interpret AQAP more restrictively than Lederman did in secret, which might have challenged the OLC memo authorizing the Awlaki killing (yeah, I know, the chances of that are almost nonexistent). Furthermore, I wonder whether the Administration told Congress they had already effectively legally expanded the AUMF? McKeon counterpart Carl Levin’s call for the Administration to release the memo makes me wonder whether he has seen it, and if not whether he knows the Administration legally expanded the AUMF by secret fiat. Which is why Glenn’s point that the Administration avoided not just Article III oversight, during the ACLU/CCR suit, on this killing, but also Congressional oversight is so important. I don’t support McKeon’s effort to write a new AUMF. But it is undeniable that Congress proposed changing the law in such a way that would have given the Awlaki killing more–though probably not adequate–sanction. Rather than embracing the opportunity by working with Congress to formally extend the war to Yemen and AQAP, the Administration instead operated with the secret self-sanction Lederman had already given it. The Administration chose not to avail itself of the opportunity to explain in the context of an Article III court why it had the authority to kill Awlaki. So, too, it chose not to avail itself of the opportunity to negotiate with Congress to give the Awlaki killing more (though not adequate) legal sanction. Instead, it used its own secret law-making power to do what the other two branches of government could have done with transparency and legitimacy. Update: Meanwhile, McKeon is holding the Defense Authorization hostage to his bigotry. How Can Samir Khan Be “Collateral Damage” If OLC Memo Restricted Civilian Death? Here’s the 32nd of 33 paragraphs in a Charlie Savage story describing the state secrets-protected explanation that justifies the killing of Anwar al-Awlaki. The memorandum did assert that other limitations on the use of force under the laws of war — like avoiding the use of disproportionate force that would increase the possibility of civilian deaths — would constrain any operation against Mr. Awlaki. You know? Civilians? Like Samir Khan, the other American citizen killed in the strike? A propagandist, but not–according to any claim–an operational terrorist? Yet in spite of the fact they had been following Awlaki for weeks–presumably gathering a good deal of detail in the process–they still killed him in such a way that they didn’t avoid killing an American citizen. As Savage describes, the memo also says they can only kill someone like Awlaki if they can’t take him alive. But we’ve already seen a stream of articles saying the government simply avoids capture now because it’s … well … inconvenient. Did the David Barron memo prohibit the killing of Americans if capture was inconvenient? Two more important details of this. First, as seemingly always happens, OLC simply trusted the Executive Branch agency to give it credible intelligence. The memorandum, which was written more than a year before Mr. Awlaki was killed, does not independently analyze the quality of the evidence against him. In other words–as Savage suggests–they had Awlaki on the kill list before they had actually done the review whether or not he should be there. I can see why I’d want to leave the department if that had happened to me in OLC. https://www.emptywheel.net/wp-content/uploads/2016/07/Logo-Web.png 0 0 emptywheel https://www.emptywheel.net/wp-content/uploads/2016/07/Logo-Web.png emptywheel2011-10-08 21:21:012011-10-08 22:04:47How Can Samir Khan Be "Collateral Damage" If OLC Memo Restricted Civilian Death?